It seems that few people believe in neighborhood public high schools these days. And that’s unfortunate, because neighborhood schools are central to building a better Chicago that benefits every resident. To have a city of strong neighborhoods, we need strong neighborhood public high schools. In Chicago, these schools serve over 47,000 students, or 42.5% percent of all CPS 9th – 12th graders. No other type of high school serves this many students. The opening of high schools in the last 12 years has led to declining enrollment at many neighborhood high schools. Still, these schools, which serve students of all abilities and backgrounds, continue to play an important role in our city. They act as community anchors, increase neighborhood cohesion, and have the potential to guarantee a high quality education. We know that students and their families are overwhelmed by the stress and anxiety that comes from selective school testing, the charter lottery gamble, and the uncertainty of not knowing which schools are actually doing well beyond test scores. Families that have the means turn to private schools or move to the suburbs in search of a guarantee that their children will receive a high quality education without the admissions madness. Other families, those with the least wealth and most burdens, don’t even engage in the high school application process. If a better system of safe, high quality neighborhood public schools existed today, countless families that might otherwise leave the city would remain in Chicago, and all students, regardless of income or zip code, would have guaranteed access to a phenomenal education. 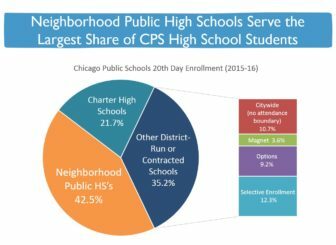 Many Chicagoans do believe in neighborhood public high schools. Across the city, individuals, schools, universities and organizations are dedicated to making these schools powerful charging stations for youth. They’re training principals and their teams to foster school climates of trust and high expectations, developing the capacity of teachers to employ the Next Generation Science Standards, giving students learning experiences beyond their neighborhoods, strengthening relationships with elementary schools so students transition seamlessly into ninth grade, working on getting students to and through college, and empowering parents to be the strongest advocates for their children. The district has been a partner in several of these efforts but unfortunately the commitment and resources have been inconsistent. Our city ought to celebrate and replicate these efforts system-wide with sustainable, long-term investments. Instead, the current climate of unbridled school competition has diverted resources and support away from neighborhood schools, putting them on an unequal playing field and exacerbating our city’s social inequality. The result? A system of high schools deeply segregated by race, class, and opportunity that perpetuates our city’s glaring disparities in youth unemployment and violence. Strong neighborhood public high schools can disrupt these disparities by providing high quality learning opportunities for students both in and out the classroom, grounding them in their communities and connecting them to the wider world. It is time to put our neighborhood public high schools front and center. We can start by putting a hold on opening or closing any high schools until our city engages in a planning process that includes educators, community residents, and city planners to determine the right number and placement of schools. This is just the first step in ensuring all our students receive the education they deserve. Generation All and a growing network of partners invite every Chicagoan to rally around our neighborhood public high schools. Get to know them. Find a way to partner with them. Talk with principals and teachers about the policies that make their work easier and those that get in the way. Pay attention and speak up when issues affecting neighborhood schools are in the news or on the agenda. We know that that tomorrow’s skilled workforce, tomorrow’s informed citizens, tomorrow’s engaged parents and tomorrow’s visionary leaders can come from today’s students. All of them. To shake Chicago’s reputation as a tale of two cities, we must invest in our neighborhood public high schools. 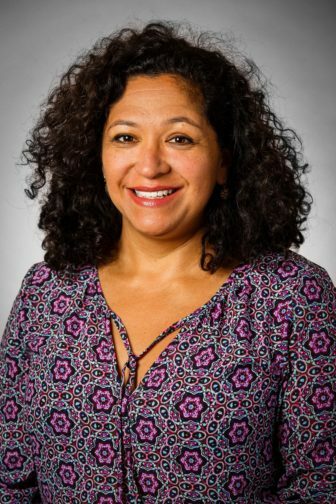 Beatriz Ponce de León is the executive director of Generation All. The city normally removes campaign signs from public property, but otherwise they become eye sores that residents have to clean up themselves.